February 16th, 2018 can not get here soon enough, and Entertainment Weekly is making things even worse. 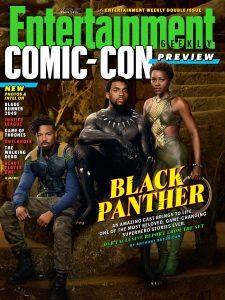 Leading into next week’s 2017 San Diego Comic Con, Entertainment Weekly has released their annual preview issue of the pop culture/ fandom event, with coverage of the upcoming Black Panther movie being this year’s cover story. The cover features the films actors Chadwick Bosemean (T’Challa), Lupita Nyong’o (Nakia), and Michael B. Jordan (Erik Kilmonger). The article goes a bit more into the synopsis of the film, laying out an international espionage/ political thriller, filled with super-heroic action. In addition to this awesome cover, Entertainment Weekly also dropped 20 exclusive images from the movie which can be found here. Check out the trailer below to keep yourself even more hyped.